Businesses from the North-West region benefit from security event held at St Ann’s Church on Tuesday 13th November 2018. Organised by Manchester City Centre Crime Prevention Panel (MCCCPP) with the support of Greater Manchester Police, Manchester City Council and Atmaana Business Consulting, this annual event aims to inform businesses about current issues facing the region and better prepare them in dealing with any security challenges that they may face. Deputy Mayor and Panel Patron, Baroness Beverley Hughes opened the event and Assistant Chief Constable Russ Jackson QPM from Greater Manchester Police gave an update on Counter Terrorism. Baroness Ruth Henig spoke about the contribution and challenges of regulation in the security industry and other presentations covered City Centre Policing and the pending introduction of Project Servator. 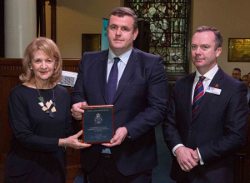 The event also hosted the presentation of GMP Business Watch Coordinator of the Year Award which was presented to Joe Mossford, Security Manager at the Midland Hotel by ACC Jackson and Baroness Hughes. Joe has been with the hotel for 15 years and is also the current Chair of the Hotel Security Information Group (HOSIG) and helps coordinate intelligence throughout the group. Joe and his team work closely with the Police especially when Party Political Conferences take place. “His support to the Police at major events, such as Party-Political Conferences help to ensure they pass without major issues”. Commenting on the event, Paul King, Chair of the MCCCPP stated “The event provides a fantastic opportunity to come together and share best practice helping to provide a safe and secure future for businesses going forward”.